Will Hutchins reminisces about Noel Marshall. Noel Marshall! A thousand pardons. Back in the ‘60s my sainted ex, Antonia Christiana, our baby daughter Jennifer Jane, and I followed the salmon to Saskatoon, Saskatchewan, thanks to yet another gig in the farce ‘Never Too Late’ which put bread on the table for two years. 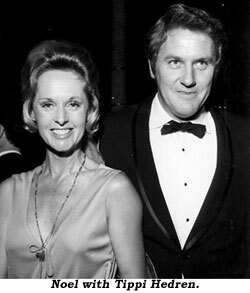 Tippi Hedren was up thar, too, starring in the drama ‘A Hat Full of Rain”. Noel Marshall, her husband, smelled something fishy, and it wasn’t the salmon. He insisted Tippi be paid up front. Me? I asked for walking-around money. That’s all I got! Laffin’ and scratchin’ the Marshalls and the Hutchins returned to La La Land. We broke bread. A handshake. Noel was now my manager. The fun began. Jim-dandy adventures to flickfests south of the border, Panama, San Blas Island, Colombia (at the airport smiling soldiers with guns frisked me), Uruguay, Buenos Aires, Peru, Machu Picho, Inca dinca doo. Fun in Acapulco, para-gliding. 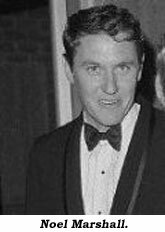 Fellow festers included Diane McBain, Ted Cassidy, Susan Oliver, Walter Pidgeon, Adam West, Ben Gazzara, Janice Rule, Ina Balin. Wondrous memories. The Good Neighbor Policy in action. We came back with salsa in our blood. Now, it’s 1969. Africa calls! Flyin’ down to Rio on our way to Joburg, South Africa, we rent a flat and drive up to Rhodesia (now Zimbabwe). Tippi’s director and co-star George Montgomery greets us at base camp, the Sentinel Ranch, by the Limpopo River. Tippi, George, and a splendid Brit cast go to work on “The Devil’s Harvest”. Noel and I buzz off into the wilds. At Wankie National Park the game warden is a stalwart soul, tending to wounded lions and elephants. When the rainy season hits, the hunter spiders scamper, chasing their prey. The warden steps up on a chair and his wife shoos spiders away with a broom. I shoot every animal I see with my trusty 8mm wind-up movie camera. “Hey, Noel! See that log? Throw a rock at it.” He does. I start shooting. The log shudders and slowly glides into the river. A giant croc. At a rest stop we’re beset by a band of baboons. We sit perfectly still as they steal away all our boxes of shortbread in the back seat. We drive on and spot a leopard. A flight over Victoria Falls. Another flight in an open cockpit Tiger Moth—loops and slow turns. We chase a black rhino as he lumbers down a wadi. Zambia. We trade shirts for wooden sculpture. Boat rides in Botswana. We eat fresh bream and guiltily, Impala. Best meat I ever did eat. Noel misses Tippi. I drive all day the length of Rhodesia. Nightfall. I’m fair bushed. Ooops! I drive off a bridge onto rocks, 25 miles from camp. We set out afoot, a flashlight our only weapon. Leopards be damned. A few miles along the trail some lads in a truck come to our rescue. Next day, we go back with two ranch hands and primitive tools to pound the Fiat back into shape. Tippi gives a farewell Champagne party and we all get properly swacked. Off to Nairobe and William Holden’s Mt. Kenya Safari Club and Game Preserve. This is Africa! We’ve seen and love all the animals. We hate poachers. Off to Cairo, the pyramids, the Sphinx. On to Athens. Richard Deacon invites us to a party, the opening of a gambling casino. Whatta kick gambling and gamboling with Eve Arden, Wilt Chamberlain, Tom Tryon, Eartha Kitt, Lloyd Bridges, Larry Storch, Gypsy Rose Lee, and the ever popular Vikki Dougan. Sail on to Dubrovnik, Yugoslavia and Venice. Bologna, Florence, Rome, Paris, London. Lodge in Lily Langtry’s old digs. Back to the land where the smoke does not rise. Now, it’s 1970. Noel ships me back to Rhodesia to act in “Shangani Patrol”, the saga of the Matabele uprising and slaughter of British Troops in the 1890s. Shades of Custer’s last stand, sort of an Oreo western. I play Burnham, a yank who escapes the carnage and returns to the U.S. taking the Boy Scout movement with him. I feel too close to all the fine folks I worked with, including Masai warriors, to be objective. Aces in my book. Back in Hollywood, I’m walking past an independent movie studio across from Paramount. Fate plays funny tricks. Workers are slathering a huge poster on the wall facing Melrose Ave. advertising “Shangani Patrol”! Bigger than life is my picture as Burnham, floppy hat, stubble, fringed jacket, jodhpurs, boots. I yell to a workman, ‘Hey, that’s me!” “Who are you?” I spell it out, and durned if he doesn’t print WILL HUTCHINS in big red letters. All that free publicity for six months. Every day I chuckle, thinking of two guys who have their offices at Paramount. They don’t exactly cotton to me, and vice versa. Every day for six months, when they drive out of Rudolph Valentino Road onto Melrose, there I am, big as King Kong, looking down on ‘em. Heh Heh. Now, it’s mid ‘70s. 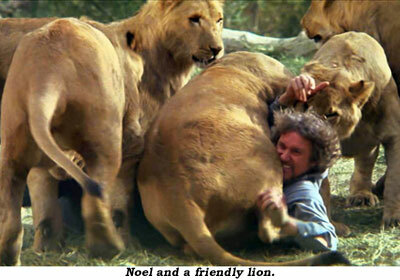 With money he made producing “The Exorcist”, Noel buys acreage in Acton, CA, as a sanctuary for wild animals. With Tippi and his three sons he concocts the likes of an African compound, replete with buildings and a small lake. He adds a script and actors (some of them human), and Voila! “Lions, Lions and More Lions”. Later shortened to jes’ plain “Roar!” The project becomes almost Biblical. Fires, floods, earthquakes ravage what they hath wrought. A jumpy highway patrolman kills the star lion. Nothing can stay the Marshalls from their appointed job of work. They re-build. The calendar pages flip to 1980, and once again I fly away, this time to Ashton’s Circus in Australia. I’ve sure done my share of dumb stuff, and the dumbest was not consulting Noel and not leaving my house in his hands. When I came back in ‘83, Weird Al Yankovick was living in my house. I wrote a powerful sorrowful letter to Noel. He didn’t answer. I never saw him again. I read he died in 2010. Noel, I’m sorry I let you down. You were a hero. You played the best game of gutsball I ever did see. Yes sir, a slew of dumb stuff…but I got one thing right. When I got back to America, I met Babs under the big clock at 34th and Broadway in The Big Apple. We’ve lived happily ever after.